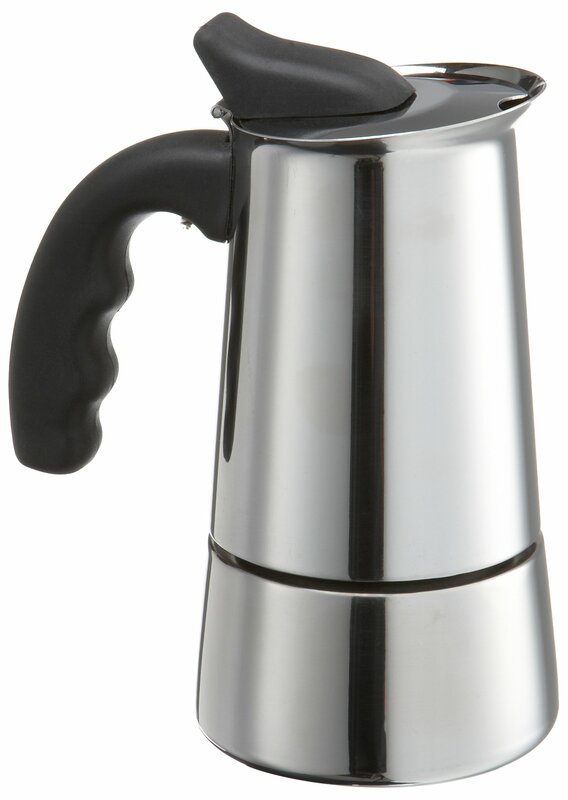 Home › Home and Kitchen › Primula 6-Cup Espresso Maker - Finely Crafted Stainless Steel - Stay-Cool Sil..
HISTORY OF ESPRESSO: Espresso is a specialty coffee brewed by forcing small amounts of nearly boiling water under pressure through finely ground coffee beans. Espresso is generally thicker and more concentrated than coffee brewed by other methods. The original Italian name meant "pressed coffee," with an implication of speed and efficiency. Updated with a modern look, our 6-cup Espresso Maker combines the sensibilities of early 20th century Italian coffee brewing with an efficient, user-friendly design. INNOVATIVE DESIGN: Crafted from quality stainless steel that allows for thorough and even heat distribution for exceptionally brewed cups of decadent espresso, our 6-Cup Espresso Maker is a welcome addition to any kitchen. Its stay-cool silicone handle keeps your hand comfortable, assures easy handling, and allows for an even pour every time. It's easy to use, easy to store, and easy to clean. USE AND CARE: To use, unscrew the top and remove the filter funnel. Fill the base with water to the level of the safety valve. Place the funnel back into the base and fill it with ground coffee. For best results, use fresh roasted, finely ground coffee with a 6-to-1 water to coffee ratio. Tighten the top to the base, and heat the espresso maker on low to medium temperature until the coffee bubbles to the top. Remove from the heat and serve. To clean, separate the top section from the base and hand wash in warm water. Do not use detergent when washing. Hand wash only. SPECIFICATIONS: Package includes (1) Primula 6-Cup Stainless Steel Espresso Maker. Size: 6-Cup At Primula, we create items by exploring how people prepare beverages indifferent cultures and work to understand the experience and ritual behindthese preparations. Identifying why people love different and unique beveragesis the first step in our creative process, our products are designed to exceedthe expectations of our customers. Designed with a modern flair, our espressomaker will deliver the bold, concentrated brew you crave from your favoritecoffee house without leaving home. Our 6-Cup Stainless Steel Espresso makeruses the traditional pressure system originally designed to produce the deep,robust flavor you expect from your espresso. Preparation is simple and in justminutes you'll be enjoying your favorite brew. At Primula, somethingextraordinary is brewing.